Meet and exceed the needs of insurance companies, insureds, TPA’s and defense attorneys. 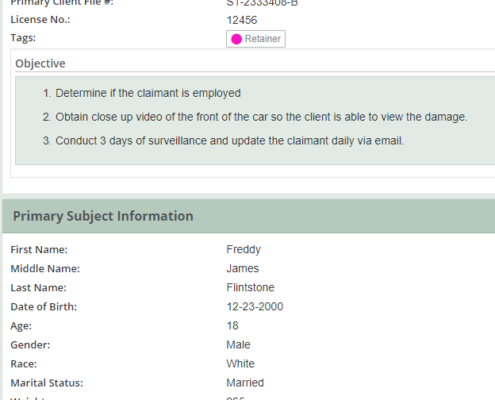 CROSStrax has valuable features for insurance investigations. From AOE/COE, recorded statements, activity checks, alive and well, to surveillance, case management can be used to assist investigative efforts. Note tasks and schedule investigators. Ensure date specific requirements are met. Send updates with photos or video. The client can has the option to view or download the file. Don’t miss out on new business. CROSStrax exceeds requirements for vendor panels and RFP’s. We all know losing a client is expensive. So is using multiple programs to handle the amount of video, photos and audio insurance investigations can produce. A well known file sending and backup service starts at $9.99 per month. When you start adding storage capacity to these services, they get expensive quickly. Utilize CROSStrax and securely store everything in one location.